As if our SwimWays pool noodles weren’t already tons of fun, just wait and see what other fun things you can do with them this fall! 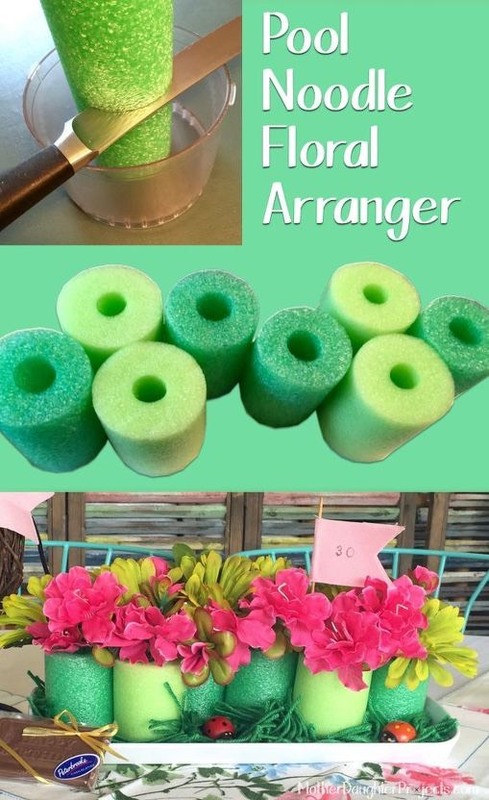 Save a ton on pots or jars by arranging your flowers in pool noodles! While the colors in the photo may not match your autumn color pallet, mix it up with yellow or orange noodles and flowers! All you need to do is cut the noodle and flowers down to size, glue the noodles to a tray and to each other. Then, place the flowers inside! Many kids want to go as a Star Wars character for Halloween (who can blame them? It’s a classic!)! 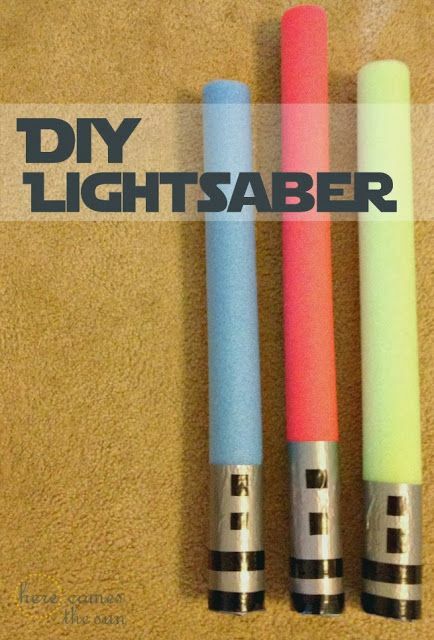 Make an affordable lightsaber accessory for their costume with a pool noodle! Simply cut the noodle to the size you want, and wrap some silver duct tape around the bottom as shown in the picture. Then, place a few pieces of black electrical tape on top of the duct tape. And there you have it- a simple, fun-to-make Halloween costume accessory! 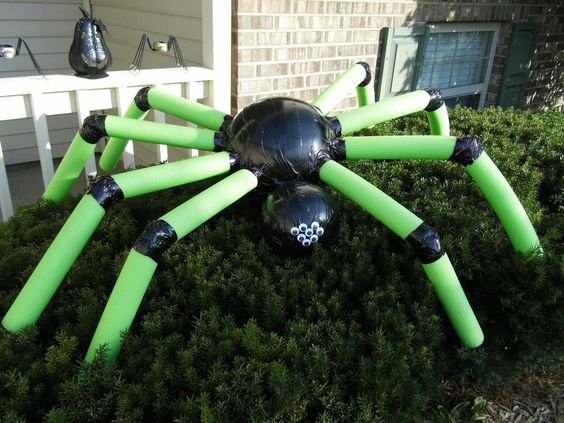 Have any Halloween yard decor contests coming up? Here’s an awesome idea! Cut four noodles in half or use 8 full sized noodles. Bend each piece at the halfway mark and wrap duct tape around that spot. Then take two different sized plastic balls and wrap duct tape around those as well. Glue plastic eyeballs on the head and tape the legs to the spider’s body. 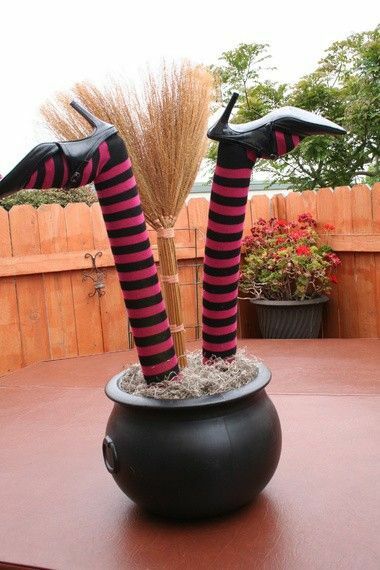 Put this simple Halloween decoration together with just nine items: black pot or cauldron, 2 pool noodles, old shoes, tall socks, a broom, rocks, bamboo sticks, foam and Spanish moss. Stuff the foot of the sock with Spanish moss, then stick a pool noodle inside the sock. Place some rocks at the bottom of the pot and then put a piece of foam on top. Stuff the pot with moss, stick a couple of bamboo sticks inside the pool noodles and stick the bamboo sticks into the foam. Place a shoe on the foot and a broom in the background for a more authentic look. For a spooky, haunted house look, make these pool noodle flame-less candles in just a few easy steps! Cut and paint your pool noodles black. Use hot glue to glue the noodles together and tie them with some black rope (or rope you painted black) and glue the rope in place. 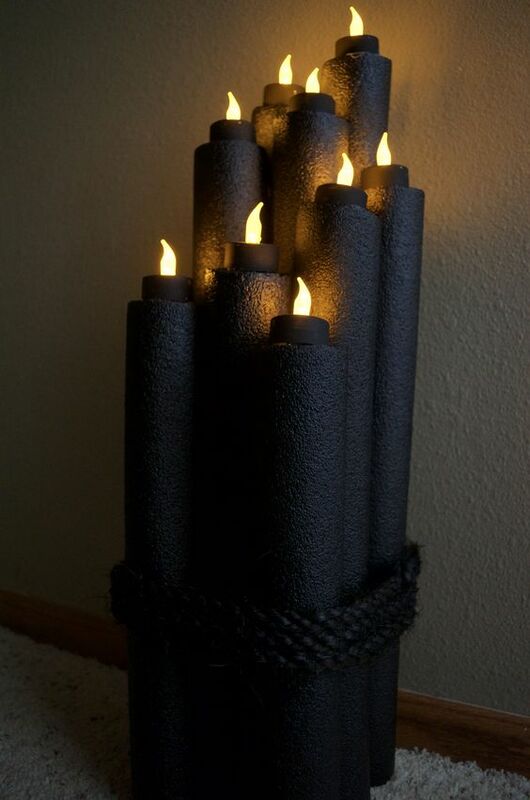 Paint the bottom of the battery-operated tea lights black to match, and place them on top! Last but not least, we have one of the more common ideas: a pool noodle wreath! The best thing about this is that you can easily create different ones for different seasons! While the instructions for this one say to use a foam wreath, a pool noodle will work the same once you’ve cut it down and taped the ends together. To see more awesome craft ideas for pool noodles, check out our Pinterest board! We’d love to see some photos of things you and your family have come up with! Share some photos and tag @SwimWays on Facebook, Instagram or Twitter!